Objective: To assess the efficacy and safety of the selective a!-blocker doxazosin in black men with lower urinary tract symptoms (LUTS) suggestive of benign prostatic hyperplasia. Patients and Methods : An open-label study involving consecutive patients with benign prostatic hyperplasia. They were asked to complete the International Prostate Symptom Score (IPSS), with its eighth question (bother score) and perform basic uroflowmetry. The study involved the use of doxazosin for the treatment of symptomatic benign prostatic hyperplasia in three phases. Phase 1 of washout period/enrolment, a two weekly interval titration phase and a maintenance phase for four weeks. The symptom score (IPSS), bother score and uroflowmetry were used to evaluate the severity of the condition and the efficacy of the drug. Results: Twenty-four patients were enrolled into the study, only 18(75%) completed the eight-week study. The ages of the patients ranged between 46 years and 82 years with a mean of 66 years. (SD, 10.0) Fourteen patients were stabilized on 4mg doxazosin while the remaining 4 patients had 2mg. There was significant improvement of the symptoms, with a remarkable sharp decline after two weeks of medication in IPS S by 8 points from baseline. The improvement was sustained over the following six weeks period. The bother score (quality of life index) was similarly observed to decline from a mean of 4.7 at baseline to 1.3 at the end of the study. The clinical trial showed a significant increase in the urine flow rate with an improvement of 4mls/second from baseline and a 24.1 % increase in voided volume. There was no adverse event recorded in all the patients to warrant discontinuation of the study. Conclusion: Doxazosin is an effective and well tolerated drug in the treatment of symptomatic BPH inNigerians. Background Missing intrauterine contraceptive device (IUCD) is a known complication of IUCD use. Objective To examine the methods of diagnosis and Management modalities of missing IUCD at the University of Nigeria Teaching Hospital, Enugu. Materials and Method This was a retrospective review of the records of all clients who presented with complaints of missing IUCD over an 11 year period, from 1 st January 1990 to 31 st December 2000. Relevant information on biodata, methods of diagnosis and removal were extracted and analysed using tabulations and simple percentages. Results A total of 44,975 clients were seen at the family planning clinic within the period under review. Twenty two thousand, one hundred and sixty eight clients used IUCD, giving a 55.96% of total contraceptive use. Of these, 20 IUCD missed, giving the incidence of missing IUCD as 0.08%. The mean age of clients with missing IUCD was 38±2.18 years and the mean parity was 6.00 ± 0.54. Majority (30%) were asymptomatic. Twenty five percent presented with lower abdominal pain. One client had a co-existing pregnancy of about 10 weeks. The commonest mode of diagnosing missing IUCD was the use of plain abdominal x-ray with a marker in-utero (50%) and retrieval hook was used for removal in 45% of the cases. Three patients had exploratory laparotomy for removal of the missing IUCD. Conclusion IUCD is a method of contraception most commonly used in UNTH, Enugu. Plain abdominal x-ray with a marker in-utero is a simple and reliable diagnostic technique for missing IUCD. Background Imo State University Teaching Hospital is located in Orlu, a sub-urban town in Imo State, South-Eastern Nigeria. With a high prevalence of road traffic crashes commonly involving motor bikes used for commercial purposes, trauma appears to be assuming epidemic proportions. Aim The aim of the study was to examine the causes of trauma involving the upper and lower limbs seen at the Imo State University Teaching Hospital, Orlu, determine the causative factors, and the treatment given. Patients and Methods The study was a 12 month retrospective study of the cases of limb trauma in adults that presented at the accident and emergency (A&E) department of the hospital. Results Two hundred cases of trauma involving the upper and lower limbs were seen in the A&E department within the period of the study. Road traffic crashes accounted for most of the cases seen (78%), while soft tissue injuries were the commonest injury type seen (54%). Treatment given included wound care (46%), closed reduction and casting (9.4%), as well as open reduction and plating (3.5%). Twenty percent (20%) of the patients left the hospital against medical advice. Of the patients that left against medical advice, 87% had fractures as their primary diagnosis. Conclusion Majority of the limb trauma cases were as a result of road traffic crashes; thus efforts should be directed at improving safety on our roads to reduce the burden of trauma on the health care system. There is also a need to create awareness in the community on the role of orthodox medicine in the management of fractures. 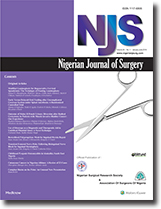 Background Plastic surgery as a major subspecialty of surgery has existed in Nigeria for several decades but the populace including medical practitioners are yet to fully appreciate its scope. This leads to very late presentation/referral of cases and management of cases that should have been referred by less qualified practitioners with attendant poor outcomes and complications. Most people still regard plastic surgery as being synonymous with cosmetic/aesthetic surgery but the scope goes far beyond this entity. It is therefore important that the public including medical practitioners who are the main sources of referral to the subspecialty are aware of the range of cases handled by plastic surgery units. The plastic surgeon in Nigeria is also faced with a lot of challenges ranging from the arduous task of one having to manage very many different and complicated cases to being very poorly equipped and appreciated. Objectives To educate the populace especially the medical practitioners on the scope of plastic surgery and the extent of development of the subspecialty in Nigeria and solicit for colleague's cooperation in order to move plastic surgery forward. To also highlight the difficulties faced by the plastic surgeon in Nigeria and seeking help from appropriate quarters which will help to reduce unnecessary referrals abroad while improving the services rendered to patients locally. Conclusion Plastic surgery in Nigeria has developed significantly both in scope and manpower but it is still faced with a lot of challenges. Knowledge of its scope will help to reduce unnecessary referrals abroad while improving services/skill here in Nigeria. Aim/Background This is an audit of number, nature, sites of impaction and methods of removals and treatment outcome of upper aero-digestive foreign bodies among children in an urban University hospital in Nigeria. Patients and Methods This is an 8year retrospective review of foreign body in upper aero-digestive tract of children (January 2001 to December 2007) was conducted at the ENT department of the University of Ilorin Teaching Hospital, Ilorin, Nigeria. Case notes of the patients were retrieved and the following were data extracted: demographic, clinical, operative and outpatient visits outcome. Results 81 children aged 9months to löyears were seen (mean 4.28, SD 2.95) with 49 males and 32 females and a male: female ratio of 1.5: 1.0.The commonest age group was 9months to 4years (76.5%). Most common of impaction sites were nasal cavity in 31 cases (38.3%), oesophagus in 23 cases (28.4%), oropharynx in 16 (19.8%) and larynx in 6 (7.4%)).The commonest FBs was coins in 33 (40.7%) in the oesophagus and 37.5% of pharyngeal FBs. Inanimate FBs in the nose constituted 31(38.3%) [Non vegetative 27(87.1%), vegetative 4(12.9 %)]. Fish bones were seen in 11 cases (13.6%) [6 in the larynx and 5 around the tonsillar fauces] and miscellaneous objects in 6 cases. Conclusion Upper aero-digestive foreign bodies are common especially among the under fours', commonest sites being the nose and pharyngooesophageal region with coins and inanimate FBs constituting about four-fifth. There is the need for parental health education on object placements, and a high index of suspicion among practitioners to facilitate early referral and avoid preventable complications. Aims and Objective To study the nature and pattern of presentation of empyema thoracis (and the association between duration or time of presentation and educational level and level of income respectively), the aetiology, and different treatment outcomes. Materials and Methods A prospective study of all patients who presented with Empyema Thoracis between January 2008 to May 2010 was carried out at ABUTH Zaria. The diagnosis of empyema thoracis was entertained from either the presence of pus in the pleural space or the culture of actively multiplying bacteria in a serous Data was analysed with SPSS 15. Results A total of 26 patients were managed, 19(73.1%) men, 7(26.9%) women. There were 4(15.4%) acute and 22(84.6%) chronic empyema. One male had bilateral chronic empyema giving 13 right-sided, and 14 left-sided empyema. Tuberculosis was responsible for 26.9% of the cases, 38.4% were post­pneumonic, while postoperative, and AIDS were each responsible for 11.5% and trauma 7.7%. Five patients had decortication, 2 had rib resection and open drainage, and the remainder were managed on tube thoracostomy. Two patients were discharged against medical advice, 6 were lost during follow-up. Fourteen (53.8%) were educated (1 acute and 13 chronic). Twelve (46.2 %) were uneducated (3 acute and 9 chronic). Fourteen patients (2 acute and 12 chronic) earned average or above average income while 12 (46.2%) earned below average income (2 acute and 10 chronic). There was no association between duration of presenting complaints and level of education or level of income (Fisher's exact test was, 0.306 and 1.000, respectively) at a P value of 0.05 Conclusion Empyema thoracis is persistent and prevalent in our environment despite improvements in diagnosis, treatment and prevention. Most patients present late and this is not related to income or level of education. The commonest organism isolated from empyema fluid in developing countries is staphylococcus aureus but most empyema fluid are sterile due to prolong antibiotic use. The factors responsible for delayed presentation, the pattern of presentation and the pathology and outcome of treatment is part of an ongoing study. Peyronie's disease is characterized by the formation of fibrous plaques within the tunica albuginea of the corpora cavernosa. It is a frustrating disease to the patient resulting in penile deformity and painful erection and erectile dysfunction. There is mixed response to medical therapy and the numerous surgical options implies no standardized procedure yet. The incidence appears to be increasing but this disease is rarely reported in Nigeria. We present three cases of dorsal and ventral Peyronie's disease treated and followed up for 2years who responded to surgical and medical treatment with satisfactory sexual life and penile erection. We highlight a unique case of an intravesical intrauterine contraceptive device (IUCD) that was discovered incidentally in the course of evaluation for secondary infertility in a woman who denied knowledge of insertion of the device. The IUCD was easily retrieved at cystoscopy as a day case procedure.